Much like Christmas, Easter is a time for us as a family to spend time together and have some good old family fun! We try to make it special by involving family and implementing sweet little traditions which the kids will hopefully look back on one day and smile! It’s never too late to start your own family traditions so feel free to take the items on our list and make it your own! 7 7. Easter egg hunt – For the adults! 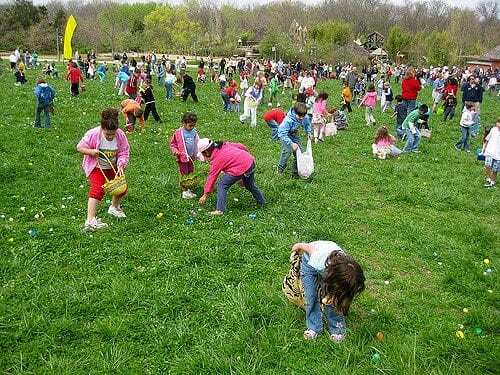 When you have kids, Easter just wouldn’t be Easter without a proper Easter egg hunt for the kids! We always have our Easter egg hunt in our own backyard and the kids just love roaming around the garden, looking for treats that the Easter bunny left behind. To make things a little easier, we bought them each a little basket to put their findings in but if your kids are a little older, why not help them make their very own Easter basket in anticipation of the big Easter egg hunt! Due to the age difference, (ranging from 3 years to 9 months old), we have them put all the treats they find together in the end and then share them equally just to be fair. We also put some healthier snacks such as carrots and pretzels in empty plastic eggs that I’ve saved over the years to try and limit the sugar overload! Another tip to making easter egg hunts work for a group of kids is to encourage them to help each other by assigning a color for each kid to find. That way the bigger kids can help the little ones find their colors and everyone wins! We have a special home-made Easter bunny plate which we use to put out carrots and water every year. I made this plate myself but once the kids are a little older, I plan on having them make one together just before Easter. We leave the plate, filled with carrots, somewhere in the garden along with a glass of milk for the Easter bunny to find. It’s pretty much the same effect as putting out milk and cookies for Christmas but I hope that with this tradition, they will learn to also take care of “others”. My husband and I also enjoy sneaking outside during the night to draw some ‘bunny paws” on the cement, using different colors of chalk. The kids just love following the trail. We use speckled egg candy as bunny droppings! Many churches have Sunrise services on Easter Sunday and serve a Sunrise breakfast thereafter. Unfortunately, our church only has a service later in the day so we created the tradition of Sunrise breakfast within our home. Considering that the kids wake up at the break of dawn anyway, we see it as spending some quality family time together and doing something a little different from our normal routine. I put out a blanket on the grass and pack a little picnic basket with goodies such as muesli and yogurt, muffins, hot cross buns and some tea and coffee which we enjoy together as we watch the sunrise! We love having family around on special holidays so we always try to incorporate them in some way or another. 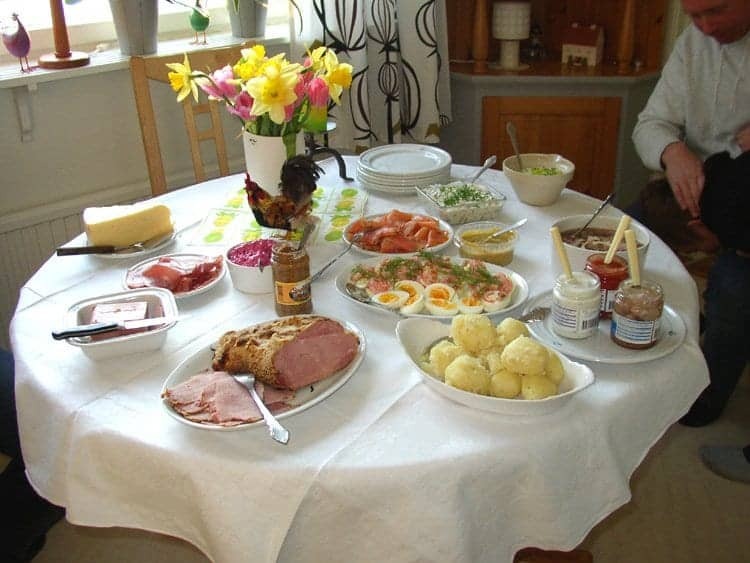 This year, we’ve invited the family over to our house for lunch on Easter Sunday. I find great joy in planning ahead and searching for ideas on Pinterest for table settings – They have some wonderful ideas! There’s also nothing more satisfying than spending a special holiday with family and loved ones around one table! This is a new tradition that I’m attempting this for the first time this year: Creating an Easter garden. The aim is to create a little garden/setting that depicts the resurrection of Christ. I find gardening very therapeutic and look forward to making this a tradition, reflecting on Easter and its meaning as I do so! When our youngest celebrated her very first Easter, I bought her bunny ears and had some fun photographing her as she discovered and ate her very first Easter egg! Now that we’re a growing family, I always get someone to take a few photos of us acting silly during the Easter egg hunt. My daughter loves having her face painted so we make her and her siblings look like little bunnies, each with their own set of ears! I also hope to capture a few family photographs during our Easter lunch on Sunday! 7. Easter egg hunt – For the adults! Why should kids have all the fun? My husband and I always buy one another a special Easter bunny and treats and we have a scavenger hunt inside the house with clues as to where to look for our treats! Now that the kids are growing older, they love to help us find our bunny! It adds a little fun to our marriage and shows one another that we still care despite our busy schedules! Seeing that we are having guests staying over during the Easter weekend, we decided to also get them a special little Easter treat! Each of their rooms contains a few hidden Easter egg and we’ve placed a little Easter basket on their beds containing a bag with treats, an Easter bunny for each individual and for the adults, a large, plastic egg containing a mini liqueur as a surprise! There you have it! 7 Fun-filled family traditions for you and your family to embrace this Easter! We wish you all a wonderful time with your families! The Bambo Nature Diaper Review: A Greener Choice?